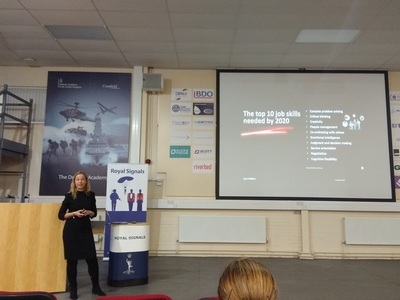 On the 13th of November, 2018, I had the opportunity, together with other industry experts, to attend and present at the 2nd Annual Royal Signals Women in Technology Conference at the Defence Academy in Shrivenham, UK. Six months of intense and dedicated planning with the RSignals Army event organisers led to an extremely successful event. 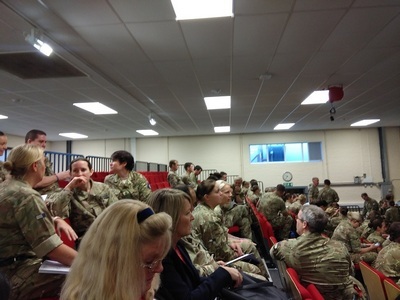 The objective of this event was to bring together women and commanders from across the Corps to inspire and encourage female officers and soldiers serving in the R SIGNALS to maximise their potential and remain engaged with careers in the technical and big data field. The theme of the event was “Professional Confidence.” All activities and presentations were geared around inspiring confidence and equipping the just over 150 army cadets/officers who attended with practical skills, as well as sparking curiosity in the field of technology and big data. 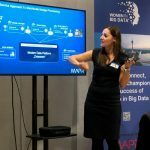 After speaking at the morning workshop about Women in Big Data to an extremely packed audience, I invited two of my female colleagues, Susan Kipke and Amanda Windsor, to share their everyday work experiences as a Data Scientists and IOT SME. This allowed the audience to get intimate with the topic and ask questions about skills they would need to be in those fields. During the networking hour that followed, I got to meet officers who, like myself, had come from diverse cultural and social backgrounds and were just as passionate about leveraging technology in innovative ways to inspire and drive everyday change in their organizations and communities. 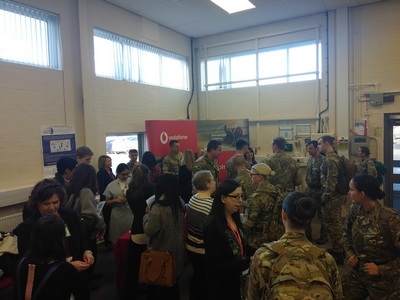 It was a great experience to see so many attendees (both female and male) from the Royal Signals forces, as well as corporate colleagues; all shared in exchanging best practices, learning and listening and discussing what we need to do to attract more women into Technology & Big Data. 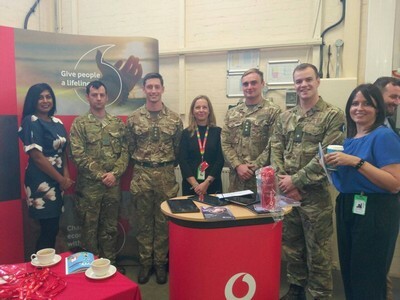 The event allowed companies like SAP, Vodafone, Cisco, J-Hub, JFC, and others who participated in this event to support the Royal Signals to get a better understanding of the factors that may be deterring our female soldiers and officers from putting themselves forward for the technical challenges the Corps presents. Activities and Workshops were led by experts from within Defence Force, as well as from the private sector (including Vodafone and CISCO), who featured topics such as cyber, robotics and artificial intelligence, and data science. In addition, workshops focused on practical skills, such as how Commanders across the Corps can gain confidence in their day-to-day roles and sell themselves at interviews. From Vodafone, our Key Note speaker was Silke Eggert, a high-tech leader who uses her knowledge and abilities to allow her teams to exploit their skill sets and potential. She serves as a role model, as she stresses the importance of bringing everyone to the table to create workable solutions. 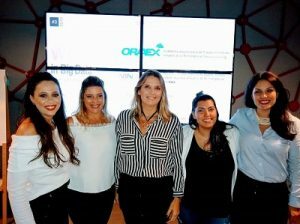 Her topics certainly had an impact with the audience, as they resonated on subjects many women still struggle with: the Ingredients of Success and The Top 10 Job Skills Needed by 2020. The highlight of the day was certainly the keynote speech from Anne Bulford, Deputy Director General, BBC, and she left both men and women attendees with a lot of food for thought! It was inspiring to hear from someone like Anne, who has gained a key leadership role in a very male-dominated media industry. Beyond that, Anne has leveraged her role and influence in tech into a platform to help women support one another. She defines leading by example, and the audience felt grateful to have someone like her to look up to in such a male-dominated field. My parting words to the wider network of amazing women and men I met at the Army that day was: Be a Canary among a sea of Swans…. I am one of many examples of this (even though I am shy by nature and do not enjoy public speaking). Together with my Vodafone colleagues Nahia and Liisel, we do strive together to be Canaries among a sea of Swans because we do not feel comfortable staying silent. 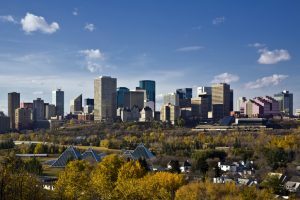 Our respective social media feeds have helped us become better citizens of the tech and big data industry. Thanks to all who attended, as well as those who worked hard to organise this great event!